Submitted by ANGELnWard14 on Thu, 01/20/2011 - 21:44. CHN Joins Detroit Shoreway & City of Cleveland to Host HUD Press Event Third Round of NSP Grants Announced On September 9, 2010 CHN, Detroit Shoreway and the City of Cleveland welcomed Assistant Secretary Mercedes Marquez of the Department of Housing and Urban Development (HUD). Marquez announced a $6.8 million award to the City of Cleveland for the third round of funding through the Neighborhood Stabilization Program (NSP). NSP was established for the purpose of stabilizing communities that have suffered from foreclosures and abandonment. Through the purchase and redevelopment of foreclosed and abandoned homes, the goal of the program is being realized through continued progress from NSP1 and NSP2 investments. CHN has been utilizing NSP funds to acquire and rehab vacant homes in Cleveland’s Strategic Investment Initiative (SII) neighborhoods already experiencing early success—78% of rehabbed homes have been sold or are under contract. Known as Opportunity Homes, this collaborative effort with Neighborhood Progress Inc. (NPI), Enterprise Community Partners, the City of Cleveland, the State of Ohio and six CDCs: Buckeye Detroit Shoreway Fairfax Famicos (Wade Park area) Slavic Village Tremont Opportunity Homes homeowner Millie Davis hosted the event at her West Clinton home which was rehabbed with the aid of NSP funds. Officials from federal, state and local governments provided remarks on how this latest round of funding will continue to support the demolition and rehab of foreclosed homes to protect and enhance the vitality of Cleveland neighborhoods. Other officials in attendance were Cleveland Mayor Frank Jackson, Congressman Dennis Kucinich, Congresswoman Marcia Fudge, Lisa Patt-McDaniel, Director, Ohio Department of Development and representatives of Senator Sherrod Brown. To learn more about Opportunity Homes click here. 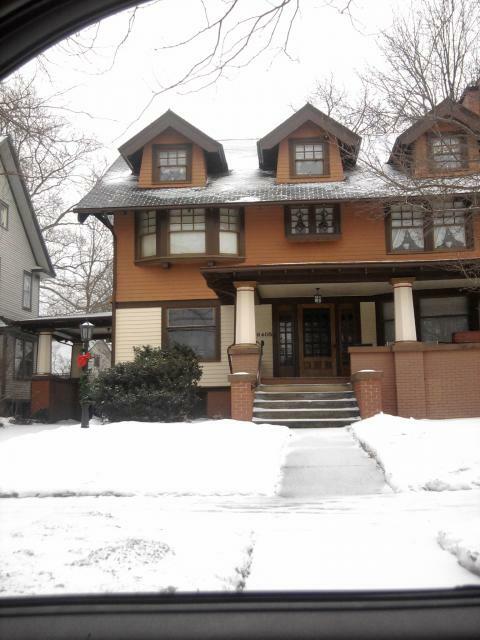 Submitted by mytown55 on Sat, 01/22/2011 - 11:24.
the City of Cleveland Housing Court ... Judge Piankas' home? Really nice photo shot. Submitted by ANGELnWard14 on Sun, 01/30/2011 - 05:12. We have starving (60,000 families a month are fed through the local HUNGER NETWORK), homeless (The need for affordable housing: 40,000 households. ), violated, and abused families surviving daily in the City of Cleveland...many struggling to survive, afford to pay rent, and pay for clothing for their children because finding work as a "quotafied" citizen of demographically challenging background including reentry/felons, undereducated, and elderly/disabled person is almost impossible. We have created an environment that snubs the people, deprives them of their lawful rights, and steers them out to create green pastures in Cleveland, Ohio. For 36 years, we have received UNGODLY amounts of Federal HUD Grants and Funds to revitalize our City and it just keeps going to hell in a hand basket with all these PLANNERS, COLLABORATIVES, and VYING ENTITIES.... It's just illogical to believe that they were actually doing any "COMMUNITY DEVELOPMENT" over the 36 years that didn't practically divide, conquer, and decimate our city into this degree of a "GHOST TOWN" status that it has become today. Judge Raymond Pianka was the founding father of the award winnning DETROIT SHOREWAY CDC.... He has a more comprehensive understanding of these planning, development, master plans, and funding methodologies than almost anyone in town...and he has rose to the top of the regime! The Honorable Raymond J. Pianka is a judge in Cleveland’s Housing Court and active in the Detroit-Shoreway community of Cleveland. The Center for Community Progress boasts Ray Pianka as one of the great ADVOCATES with an innovative approach to through his housing court at the vacant property conference back in October 2010. The Reclaiming Vacant Properties Convention hosted in Cleveland in Oct 2010 cited countless participants in this INDUSTRY around our community, how they work together, and it is amazing to see how many folks are caught up in this big government and CDC /NFP industry that is supposed to be building up our community over the last 35+ Years! Great job everyone! From the four, historically intact corners of Detroit Avenue and W. 65th, you’ll see how unique partnerships have preserved historic community fabric while creating affordable, energy-efficient, transit-connected housing, a vibrant arts district, and a planned boulevard connecting residents with the lakefront. See the Gordon Square Art District, which catalyzed development of a vibrant streetscape with galleries, shops, restaurants, and public art; Battery Park, a market-rate housing development on the site of a former brownfield encompassing a bold $50M infrastructure investment to decommission an expressway; and the Cleveland EcoVillage, an EPA-funded national demonstration project for sustainable development with housing centered around public transportation. Battery Park Powerhouse received an $800,000 Commercial Redevelopment Fund loan for the rede-velopment of the former Eveready Battery Company powerhouse at 7524 Father Frascati Avenue in the City of Cleveland into a multi-tenant commercial space. The Powerhouse building will accommo-date community facilities, a fitness center, a restaurant and a small specialty market/deli to serve the adjacent planned housing development and the existing neighborhood. The redevelopment is an effort to bring a site with a long history back into productive use, thus increasing the tax base and aiding in a new residential development in Cuyahoga County. The 29,000 square foot property was purchased in June 2006 and has been vacant for over 10 years. The property site is situated on a bluff overlooking Edgewater Park. The project consists of a 6,000 gross square foot building. An ad-ditional 6,000 square feet will be added as a second floor to accommodate community meeting rooms and a fitness center. A linear Boulevard Park in the center of median of West 75th Street ends in a large public green that overlooks the lake, and is adjacent to the Powerhouse structure. A bike/walking path is planned to wind through the park and connect the property to Edgewater Park. Upon redevelopment, Battery Park Powerhouse will create 13 new jobs at the site. Property taxes are estimated to increase to $47,000 in 2010 (after OEPA abatement expires in 2009) as a result of the prior cleanup and current redevelopment. ...all of these creative projects are amazing collaboratives with lots of extraordinary results that drive a PHILANTHROPIC INDUSTRY in NEO (of HIGHLY PAID ADMINISTRATORS) towards a future vision...Meanwhile, the quotas come from the average citizens who have NO CLUE about a great majority of these development schemes as provided via the PUBLIC PARTICIPATION Requirements of HUD.... I bet a door to door survey would astonish HUD leadership regarding the integrity of the City of Cleveland and the local NOT FOR PROFIT CDC INDUSTRY....unless of course-they are also involved in the lack of oversight on these matters.... COUNTLESS FOLKS HAVE GOTTEN ON THIS AMAZING BANDWAGON so that they can receive those billions of dollars in funds that go through our city Annually via the trickle down economics of GRANT FUNDING....and countless citizens, residents, and stakeholders have no clue about ANY OF IT! They just keep trying to survive the rat race of life that seems gut wrenching at times in our city when faced with so many needs by the people who are losing benefits, losing jobs, and losing their American Spirit after chasing assistance in all of these federally funded venues… They don’t want to empower the little people who serve as quotas. These leadership organizations (CDC's) have learned how to treat the "less than desirable public at large" (steering them out of BOD's & membership) in order to manipulate this ENTIRE PROCESS and ascertain uninterrupted grants, work through countless projects, and never be held accountable for their abusive practices... or their failed projects. We attended the "ANNUAL PUBLIC PARTICIPATION FORUM" at Lutheran and the leader of the dog & pony power point presentation seemed interested and "DUMBFOUNDED" by our allegations about the ongoing abusive practices including escalations of physical assaults on outspoken activist/disabled veterans by a local CDC development director. We cited case example after case example---and I didn't see him take a note...just defer to writing our "Surveys & Submitting them" and year after year this occurs per one actively engaged attendee.... We discussed Code Enforcement issues with CDC's puppeting City Inspectors who are 'complaint driven' and working collusively by and through City Council's MASTER PLAN effectuation game through established CDC's and in coordination with City Housing Court. The public is encouraged to participate in every phase of the application development process. Planning stage meetings are conducted to solicit information regarding neighborhood needs and project suggestions. These may be citywide or conducted within each of the eight planning regions. Notification of planning sessions and public hearings is accomplished through full use of radio, television, newspaper and newsletters. Those unable to attend a session may call the Citizen Participation Hotline at 216.664.2869, or contact Community Development via email or fax (216.664.4006) to offer suggestions. Let's use the Old Brooklyn neighborhood as just one citable neighborhood that has been exploited in this regime's activities.... ask the residents just how aware of the details of their “Master Plan” they are??? Moreover, the EQUAL OPPORTUNITY CLAUSE of the CITY OF CLEVELAND regarding protection for unsuspecting contractors and doing business with the City of Cleveland is also a joke for ordinary, unconnected, and new small businesses locally. I have been personally told (and seen it) that "unless you come downtown and get connected with the right folks...you will not be getting any contracts because it's all about "who you know" to get them slid through..." Surreal. What a way to do business: putting ethics right out the back door from the start. Sad that our generations of business folks locally have learned that this is a normal, acceptable, and the only effective way to do business here...through corruption... Congrats to all the folks who made it past the regime and earned your contracts at all levels through whatever methods you had to use including but not limited to: paying kickbacks, doing "Favors" for players, and asskissing in backroom deals with the regime to get your contracts put to the top of the list....Amazing world we live in!